The New Decade Series provides great synopses of the musical decades and lets you play the iconic songs along with optional orchestrated backing tracks that make you sound great! The audio is accessed online for download or streaming and features PLAYBACK+, a multi-functional audio player that allows you to slow down audio without changing pitch, set loop points, change keys, and pan left or right – available exclusively from Hal Leonard. 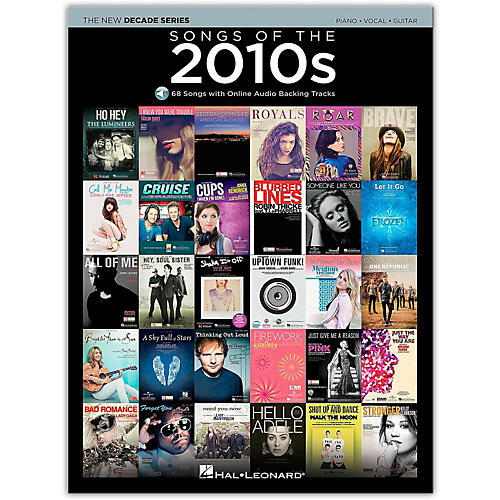 The 2010s features over 65 top hits, including: The A Team • All About That Bass • All of Me • Bad Romance • Blurred Lines • Brave • Call Me Maybe • Cups (When I'm Gone) • Empire State of Mind • Forget You • Get Lucky • Happy • Hey, Soul Sister • I Knew You Were Trouble • Just the Way You Are • Need You Now • Pompeii • Radioactive • Rolling in the Deep • Royals • Shake It Off • Shut up and Dance • Stay with Me • Take Me to Church • Thinking Out Loud • Uptown Funk • Wake Me Up! • We Are Young • What Makes You Beautiful • and many more.